In 1901 Ontario, Canada, Benji Alston and Red Stockard lead very different -and separate - lives. They are connected only by a mysterious figure who inhabits the forest. For Red and his friends, this presence is known as the South Woods Lion Man. 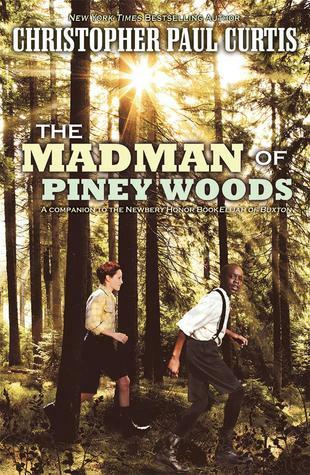 To Benji and everyone he knows, his name is the Madman of Piney Woods. Through a series of encounters with this strange and elusive man, the boys grow ever-closer to meeting each other, saving a life, and becoming good friends. One of the many wonderful things about this book is that it does not just relate known historical events through the eyes of children. Rather, Curtis tells a compelling story that immerses the reader in day-to-day life in Ontario at the turn of the 20th century, bringing the time period to life in a very real and relatable way. The pranks, fights, games, and conversations the two main characters have with their friends and family members are lively, funny, interesting, and exciting, giving readers lots of reasons to enjoy the book and to see it through to the end. Kids will love the hints of mystery and adventure that accompany the historical details, and they will find it easy to love both Benji and Red. This book is a companion to Elijah of Buxton, but it takes place 40 years later, and its connections to the first book are slow to reveal themselves, but well worth the wait. Though it is possible to enjoy The Madman of Piney Woods without reading Elijah of Buxton first, the emotional impact of the final quarter of Madman can never be as strong as the author obviously intends without knowledge of the events of Elijah. The NetGalley blurb for this book states that it "will break your heart -- and expand it, too," and this is absolutely true. The story is beautifully told and beautifully written. Very intriguing concept – both the setting and historical plot. Thanks for bringing this one to my attention. I really enjoy historical novels. Thanks for the feature.